Kawachi Otokobushi (河内おとこ節) is one of Bon Odori Song. It is the song of Osaka, but it plays widely even in Tokyo. It is very rhythmical dance. 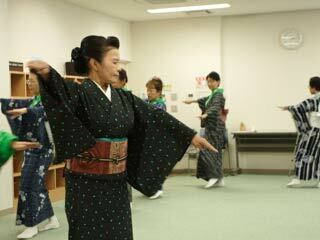 Do "Okesa" hand move with right foot forward 2 times. Do the other side times. Two step back from right then left with swinging arms. Right foot and bend knees little. Then step right hand front and open hands from chest. Right hand forward, and left hand up. Step right back and close again. Do the other side, but stand up straight. Open and right step. Right hand up left hand side. Step forward and draw Mt. Fuji.